Unless you've been on an internet cleanse for the last two weeks, by now you've probably heard of all the shenanigans that went down at this year's Coachella. Sure, there were a number of celebrity appearances, from songstress Katy Perry being spotted in the crowd (oh hey girl, I didn't know you were obsessed with M83's "Midnight City" too!) to even former "It" girl Mischa Barton (yo, when's the last time anyone watched The OC?). 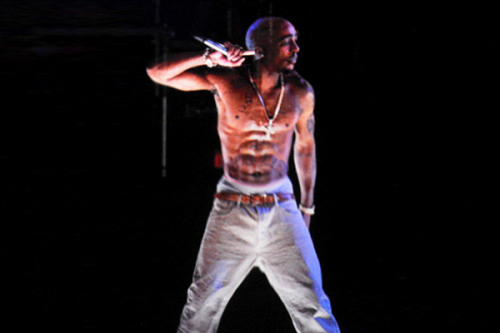 Even still, the most talked about event of the festival was the arrival of hip-hop legend Tupac Shakur in hologram form during Dr. Dre and Snoop Dogg's set. I can't answer these questions but I do know that being a hologram doesn't mean you can't have a sense of style. Tupac was dressed in the popular hip-hop fashion of his time when he appeared on stage this year. A brown leather belt couldn't stop the sag of his faded jeans, but at least an impressive set of abs were showcased by the shirtless rapper. The surprise holographic guest kept his accessories simple for this performance (noticeably absent was his iconic head bandana), with his watch, bracelet, and gold chain making a statement. 16 years from that fatal day and 2pac still be lookin fresh to death!! Even though Hatsune Miku, Japanese popstar, is existent only through hologram (as in, she is not a real person), that doesn't mean she can't put on a good show. At least that's what thousands of real-life audience members say. Hatsune keeps it girly, showing off her legs with a short dress, but also astounds us with her crazy long teal hair. Dang girl! Oh there's a historic presidential election going on? Let's get the most qualified person to discuss this topic on air for an interview! Okay okay, no hate on will.i.am. I just feel Anderson Cooper aka The Silver Fox made an interesting/amusing choice here. Anyway, will.i.am donned a contemporary outfit that was professional (saying something like "Hey I'm on CNN!") but also in tune with his role as a musician ("...but on the real, I'm just that guy from the Black Eyed Peas"). Let's give it up for mixing scarves, blazers, and pants everybody! This sequel to the 80s classic told us that three years from now, holographic marquees would be a regular staple in the advertisement world. 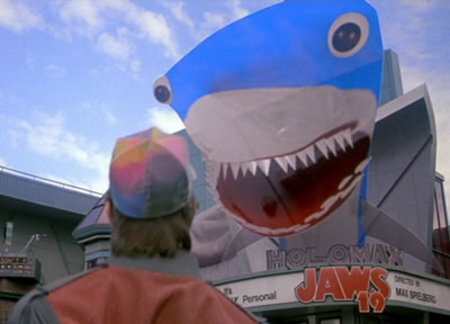 Marty McFly is terrified by the Jaws shark brought to life, a hologram that has no clothing on in this case as it goes au naturale. As far as Marty's fashion - pretty much every piece of clothing he wears in the movie franchise is perfect, and if anyone buys this sick hat for me I will be your best friend. From what I remember as a young girl, the original Star Wars claimed sole responsibility for introducing to me the idea of a hologram. Princess Leia delivers a cry for help to Obi Wan, donning her iconic double-bun hairstyle and clad in a flowing white space robe. I'm still waiting for holographic messages to replace texts, but maybe that's just me. Clearly, the concept of holographic technology has been around for awhile. But as it has progressed through the decades, the technology has become even more fun and entertaining to look at! But really though. Buy me this hat. I've followed Sheila's wake of snappy sayings and tasteful use of emoticons from her blossoming days at Everett High School in Washington. This is the kind of beauty I expect her to weave together on the daily. Well done, Sheila Wagner, well done. Sheila Wagner is an up n commer as a voice for her generation. Look Out World! Here She Is! Looking forward to what's up next! this isn't a formal environment, you can definitely address me by my first name too haha. either that or princess sheba. This article makes me space-jump for joy. But really though, I'm looking forward to more from Sheila! Your insight into what will.I.am is thinking at any given moment is genius.